h2>What are ETFs (Exchange Traded Funds)? 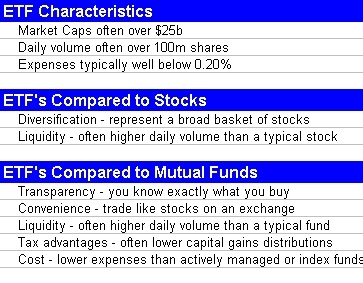 ETFs are mutual funds that trade throughout the day, the way stocks do. Currently nearly all ETFs are index funds, and as such, they generally have expenses that are a third to a half that of actively managed funds. What are the advantages of using Exchange Traded Funds (ETF's)? How can the ETF Maximizer System fit into my overall investment management approach? The ETF Maximizer recommendations can be used for virtually any account outside of your AA, SWA, DELTA or other company retirement account. This makes the ETF Maximizer a perfect complement to our other methods specifically designed to manage company retirement accounts. Do I need a username and password in order to download the ETF Maximizer Newsletter? No, we will send you an email letter when new issues are published and the Newsletter will be attached as a PDF file. What is the best way to get started with the ETF Maximizer fund recommendations? It’s best to take new positions in ETFs when new recommendations are published in our newsletter. Who can subscribe to the ETF Maximizer Newsletter? Anyone. This newsletter is not just for employees of American Airlines, Southwest Airlines or Delta Airlines. In fact, this method of managing one’s accounts is widely applicable to many people and for many investing situations. Why have ETFs become so highly popular? Because they solve a lot of problems for investors! For example, they do not have early redemption fees like many traditional mutual funds. The commission for trading ETFs is usually the same as trading a stock which is often a big advantage over traditional mutual funds. Also, they have low management fees and they have certain tax advantages. In general how does the volatility of ETFs compare with stocks and traditional mutual funds? Typically, ETFs will have lower volatility than specific stocks and higher volatility than traditional managed mutual funds. Of course, this can vary depending on the specific selection. What do I need to do to get started using ETFs to manage an account? Of course, you’ll need an account established at a brokerage house. You may already have one, but if not you can set up a new account at any brokerage house you prefer. Be sure to check that you can buy a wide range of ETFs at your brokerage. And also please check the commission costs for trading ETFs, but they are usually the same as the costs for trading stocks. Can I use ETFs in both retirement accounts and regular accounts? Unless there are restrictions that we are not aware of, you can use ETFs in most all types of accounts. Of course, the beauty of trading ETFs in retirement accounts, such as IRA’s is that you do not have to keep track of all trades or report this information to the IRS each year. How do I manage the allocations of money to the recommended positions? With each new set of ETF recommendations, we specify how many ETFs to hold. Let’s say the last recommendation is to hold 3 positions. The idea is that one would initially invest equal dollar amounts in each of the 3 ETFs. Then, maybe the next recommendation is to replace only one of the ETFs with a different ETF. The easiest way to do this is to sell the holding in the ETF being dropped and buy the new ETF with the receipt from the sell. That, of course, will result in each of the 3 positions being held with slightly different amounts of money. But as long as they are roughly in the same proportion it is ok and after all, it saves you money on commissions to not trade all holdings just to have an exactly equal balance. On the other hand, it is a good idea to check the percent holdings every few months and rebalance when they depart significantly from an equal amount. It’s not something that needs to be done very often. Can you manage an ETF account for me? Nope, we specialize in publishing the ETF Maximizer Newsletter. We have designed the system so that it does not trade very often, which means it will take you very little time to make the necessary trades. Does the ETF Maximizer make recommendations for the use of margin and short positions? We do not make recommendations on the use of margin and short positions, primarily because these techniques can not be used in qualified retirement accounts. However, subscribers could use these techniques in non-retirment accounts to augment the ETF Maximizer recommendations. Performance of those portfolios would be different than reported by ETF Maximzier because of the different approaches. How does the ETF Maximizer address the issue of bid and ask price spreads for some ETF's? We constantly analyze the volume of all ETF's and select only those with the highest previous 3 month volume for our considerations. How often are new ETF recommendations published by the ETF Maximizer? The ETF Maximizer is a monthly publication, however we monitor the markets for you every day and if there is a dramtic change in the market during the month we will issue a mid-month newsletter with updated ETF recommendations. How are the new ETF recommendations provided? We send you an email whenever changes in the portfolio are called for. How do I purchase ETF's? ETF's are widely available through most all brokerages. The following information covers basic costs at some discount brokers. This is not a complete list of discount brokers but it should give you an idea of the type of fees you will pay to buy and sell Exchange Traded Funds. The fees below were posted in January of 2011, please check with the brokerages directly for their latest fees – they often change them! TDAmeritrade - $9.99 per trade. Fidelity - $7.95/Trade for limit orders. First Trade - www.firsttrade.com - $6.95 flat rate for unlimited shares. First Trade received 4 stars from Kiplinger’s in 2011 for customer service. Zecco – Zecco offers 10 free trades per month if you maintain an account balance of $25,000 or more, after that they charge $4.50/trade for limit orders. Marsco - $3.95/Trade for limit orders online. TradeKing - $4.95/Trade for limit orders. TradeKing offers a zero fee IRA with zero inactivity fees. TradeKing was ranked by Smart Money Magazine as the top rated brokerage firm for customer service in 2008 and 2010. Power E*Trade - Both market and limit orders as low as $6.99/trade. Charles Schwab - $8.95/Trade for limit orders. Scottrade - $7/trade for market orders, $12/trade for limit orders. This broker was ranked "Highest in Investor Satisfaction with online trading services by J.D. Power and Associates.